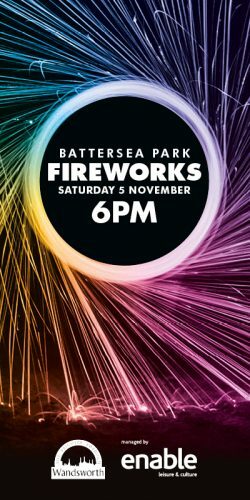 Get ready for Battersea Park’s incredible annual firework display. Bring your friends and family to watch as fireworks dance across the night’s sky to music made by legends. Tickets for Battersea Park’s fireworks display go on sale on Thursday 1 September. This year’s event will be taki ng place on Saturday 5 November will be themed ‘Legends’ and will include music and light effects. There will be a variety of food and drink stalls to choose from as well as the ever popular glow toys. Last year tickets sold out in record time! Don’t miss out – book your tickets www.enablelc.org/fireworks (available from 11am on Thursday 1 September). Gates open for food drink and entertainment at 6pm. Gates close at 8pm and fireworks display begins at 8pm. Wandsworth Council’s Battersea Park fireworks display is managed and delivered by Enable’s Events Team.